Review: Jafar Panahi is banned by the Iranian Government from making movies. He poses as a taxi driver and fitted with a camera he makes a movie about social challenges in Iran. This is a subtitled Iranian comedy drama. The original title for this is just Taxi. 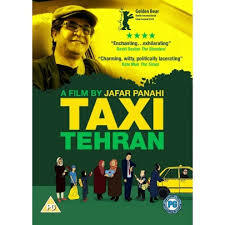 Apparently this is Jafar Panahi’s third film after his 20-year ban on film-making. This is a very engaging and interesting film. Watching this has given me a great insight into what it is like in Iran. Some of the conversations that Jafar Panashi has with his customers are very political. In this film Panahi meets an amazing range of characters. The film is a mix of politics and humour. My favourite characters are the two ladies with the goldfish. A quote from film critic Peter Bradshaw in his review “Taxi Tehran is the work of a unique director – and survivor”.